Everyone loves treat gifts and favors. From delicious brownies to sweet and sour candies, treats are a hit no matter the event. If you’re planning a baby shower and want to use treat favors, you’ll need some super cute containers to pull it off. Check out these beautiful and unique treat containers. 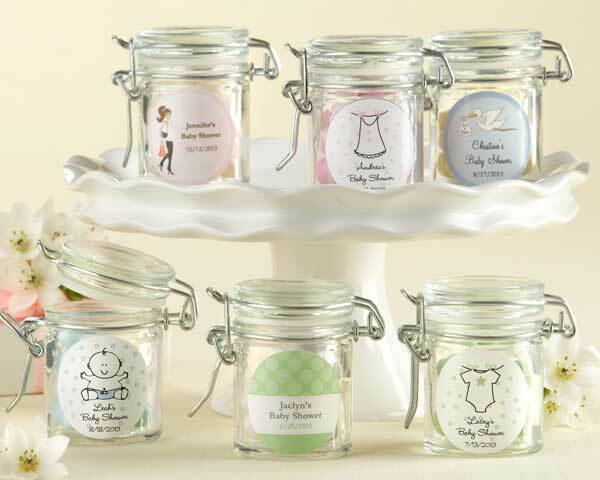 The personalized glass favor jar is a great way to display and give treat favors at your baby shower. They will hold about 40 pieces of small candy, and feature a rubber gasket seal to ensure freshness. These jars are perfect for pretty colored candy that you want to show off! They’re available in sets of 12 and come with personalized stickers you can place on the jars. 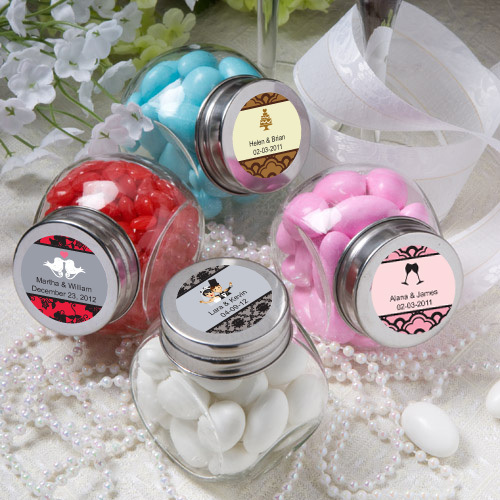 Another type of glass jar, these feature screw-on lids and also display pretty colored candy. These are also personalized, and you can choose your own pretty sticker design and text. These are available as singles and cost as little as $.92 each. 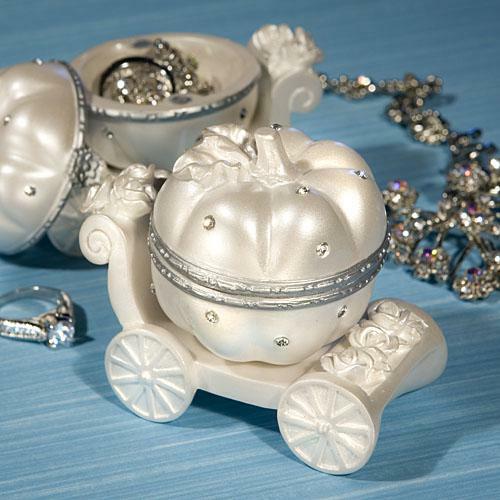 This beautiful Cinderella-themed curio box is elegant and whimsical and will hold guests’ favorite items long after the shower. Until then, you can place delicious treats inside, from a few bites of chocolate to a handful of delicious candy. It’s made of white resin and features sparkling rhinestones as well as intricate details. Another curio box that will gladly hold odds and ends, this one is beautiful and very charming. 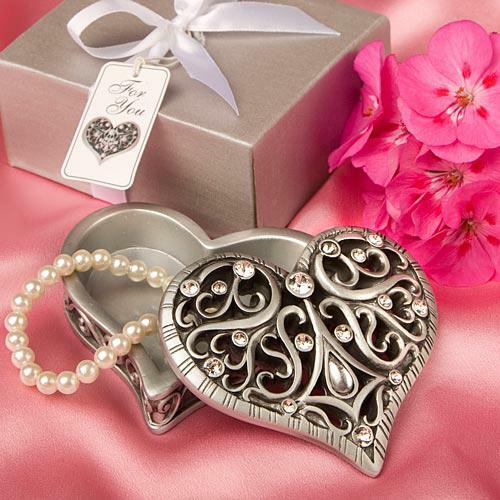 Created from pewter-colored poly resin, the heart features scrollwork as well as glittering rhinestones. Fill it with taffy, jawbreakers, Jordan almonds or your own favorite kind of candy for the baby shower. Of course, there are many, many other choices, but these few are absolutely wonderful ideas for treat containers. Be sweet to your baby shower guests! This entry was posted in Baby Favor Boxes, Baby Favor Jars, Personalized Baby Favors and tagged curio boxes, glass jars, treats. Bookmark the permalink.